Figure 2. The fertilised egg divides repeatedly to become first a ball of cells and then an embryo. Figure 3. 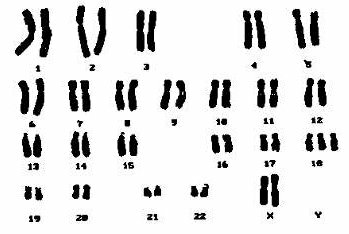 This is a karyotype of a male with the correct number of chromosomes. Figure 4. 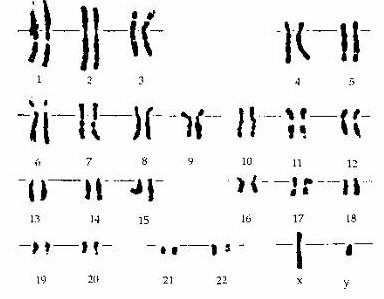 The karyotype of a male with Trisomy 13. Figure 5. 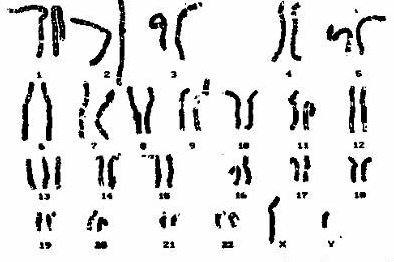 The karyotype of a female with Trisomy 18. Figure 6. Here you can see that the chromosomes did not divide correctly. The result is an extra chromosome or trisomy. Trisomy may occur in either the mother’s egg or the father’s sperm. Although the genes in the three chromosomes are normal, too much or too little genetic material in a cell affects every stage of the development of the baby. Therefore the blueprint for development is altered from the moment of conception. A very small percentage of babies are born, not with a complete trisomy but with a partial trisomy. This means that an extra piece of a chromosome is present. Babies with a partial trisomy may show some or all of the characteristics of the particular trisomy. This depends on the precise amount and nature of the additional chromosomal material. 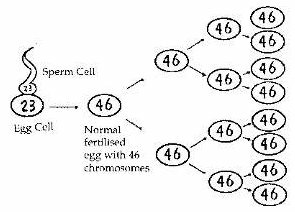 In a balanced translocation, the normal number (46) of chromosomes are present in each cell but some or all of the material from one chromosome may be located on to a different chromosome. There is no loss of chromosomal material. Babies with balance translocations are completely normal and their chromosomal rearrangement should have no implications regarding health or physical appearance. However, their children would be at risk of inheriting an unbalanced translocation. (b) that a piece of chromosomal material is missing. Balanced or unbalanced translocations can arise spontaneously where both parents have normal chromosomes. 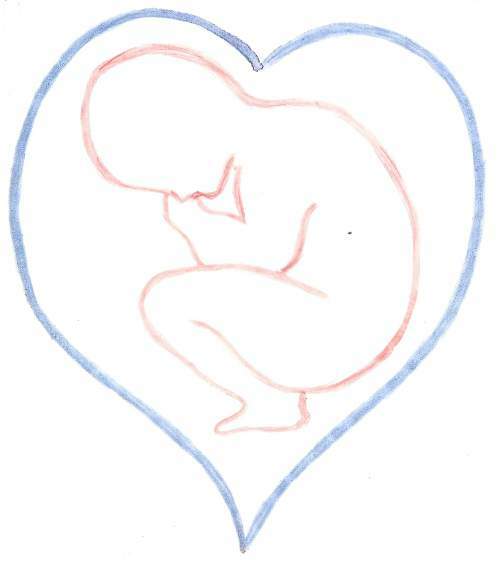 However, if a parent has a balanced chromosome re-arrangement then there can be a higher chance of that person having a pregnancy which may be miscarried or also going on to have a pregnancy which is affected with an unbalanced chromosome translocation. The chance of these happening depends on the nature of the translocation and what has previously happened in the family. In addition, where one person in the family carries a balanced translocation it is also possible that other members of the family, who are otherwise healthy, may also carry that translocation which may have implications in turn for them if they are thinking about children. A deletion is a condition where some chromosomal material is missing from the normal chromosome. In the case of a condition denoted by 13q-, the long arm “q” of chromosome 13 is missing. In the case of 18p- the short arm “p” of chromosome 18 is missing. This condition is a less common form of trisomy. It results from an incorrect separation of chromosomes after the first normal division of the fertilised egg. 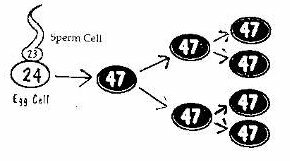 Therefore, some cells have an extra chromosome (47), while other cells have the normal number of chromosomes (46). The number of cells having the extra chromosome varies from baby to baby and therefore each baby with mosaicism is unique. These babies are often less severely affected compared to those with an extra chromosome in every cell. Here the two ends of a chromosome have broken off. Rejoining of the broken ends results in the formation of a ring chromosome and the loss of two chromosome fragments from each end. Ring chromosomes are rare. A genetic counselling service is available to all parents. Your GP, Obstetrician, or Paediatrician can refer you for counselling. Your GP may refer you for genetic counselling, if appropriate, to the National Centre for Medical Genetics, Our Lady’s Hospital for Sick Children, Crumlin, Dublin 12. In most cases, the genetic counsellor will be able to reassure you that Patau’s or Edwards’ syndrome is unlikely to reoccur.